Making use of a Caravan 15 foot, 500 Denier Polyester Sidewall is one of the best tools Caravan outdoor shelter owners have at their disposal. That's true simply because of some of the hazards that outdoor enthusiasts consistently face can be protected against using this simple panel. Things like wind, rain, and insects are all serious outdoor afternoon-killers, and a sidewall is a great defense against all of them. That's because this 15-foot wall attaches easily to the legs and frame top of any Caravan shelter with a 15-foot wall to create a convenient, secure barrier against the worst of outdoor nuisances. 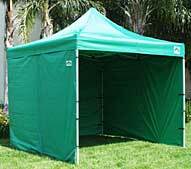 The 100% polyester fabric is 500 denier material that is strong, durable, and weather resistant. Those reasons and others make this a really popular choice for Caravan owners. Many owners find that they have needs that aren't even discussed here, but needs that this product is perfectly suited for. That's why, whether your intentions for your shelter are listed here or not, it might be rewarding to consider adding this Caravan 15 foot, 500 Denier Polyester Sidewall to your outdoor shelter. WARNING: This product can expose you to chemicals including Diethylhexyl Phthalate, which is known to the State of California to cause cancer, birth defects, or other reproductive harm. For more information go to www.P65Warnings.ca.gov. Sidewall is well constructed and heavy duty. It would help to have a photo description of how to attach the sidewall to the top. We will be using this at a hospital for an emergency treatment area and a photo would help someone not familair with the tent set it up.